Could this be the death knell for mechanical hard disk drives? Always somewhat of an aberrant part of computer systems, it's the only fixed component in a PC to have moving parts. As beautiful in their reflective perfection as disc platters are, there's no doubt that in a modern computer they're an unwanted bottleneck. Despite data densities going through the roof, the fact that a little servo has to sweep a mighty read head across these platters as fast as its little actuators can manage, its simply no match for a silicon transistor gate in speed. It's certainly not a new idea. Many years ago, Quantum offered solidstate hard drives. These were nothing more than banks of memory which had an ATA interface jury-rigged to them that cost tens of thousands of dollars and had a tiny capacity. 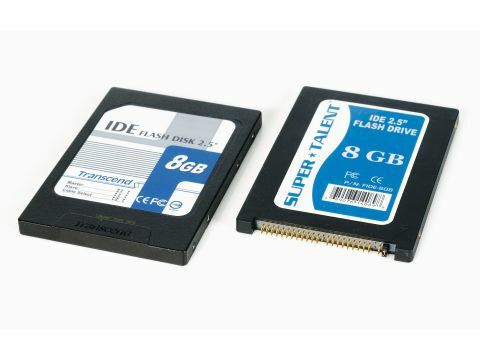 While these devices are still available at far greater capacities, the future saviour from the spinning disc's performance dead-end is NAND flash memory. This is being heralded and demonstrated by Intel as a way to accelerate drive performance by using NAND drives as a form of cache for existing hard drives. Even before this technology becomes available there are a number of flash based drives already on the market. These come packaged in a standard 2.5in and 1.8in ATA drive casing and interface, meaning they can be used with any system that supports that standard. So the majority of laptops - and with the right adaptor cable, even some desktop systems - can take advantage. For our review we have an 8GB version of the Transcend IDE Flash Drive. This isn't actually designed for consumer use - its primary market is for embedded industrial systems. Because of the solid state nature of the drive, in operation it'll happily handle temperatures up to 70 degrees centigrade (about 160 degrees fahrenheit) and has the operating shock equivalent to a 5ft drop, while the drives themselves generate no heat. All of this makes it one sturdy device and it's down to the fact it lacks any moving parts, so it has no problems with vibration or shock while running. The interface enclosure is identical to a standard 2.5in ATA drive. We're testing it on a desktop system so we've got a 44 to 40-pin adaptor. As you should have spotted, this means that it's instantly limited to ATA33 transfers. But it's not even that fast because the controller used by Transcend only supports PIO4, so the maximum throughput possible is 16MB/s. This in itself puts any thoughts of blazing performance out of the window but our interest certainly doesn't follow. As promised, installation of the drive went flawlessly. Both the BIOS and Windows XP took the drive to be a standard ATA device. Booting a flash drive system is rather eerie; it's shocking just how adept our subconscious brains have become at ignoring the whirring and ticking noise of our spinning hard drives. Without this noise, it sounds like the PC isn't actually running - almost as if it's dead and missing its ticking mechanical heart. When it comes to performance the Flash Drive didn't put up too much of a fight. Due to the size limitations we restricted tests to raw throughput measured with HDTach and boot time for a clean installation of Windows XP. The times and speeds all lag behind those of the traditional drives, but not as much as the raw throughput would have you think. The huge advantage that the flash drive has is the access times. Measured as low as 0.2ms, this offers access 40 times that of the best conventional drives. So while a mechanical drive wastes times trying to move the read head to the right physical location to fetch data, a flash drive just accesses it directly. The two extreme performances seem to balance each other out leaving the flash drives lagging conventional hard disk drives, but not by a significant amount.